Inventory We are a resale marketplace, not a box office or venue. Ticket prices may exceed face value. This site is not owned by Bobby Dodd Stadium . Bobby Dodd Stadium at Grant Field is home to the Georgia Tech Yellow Jackets NCAA men\?s football team. The stadium originally opened as Grant Field back in 1913 but was renamed in 1988 to honor the winningest coach in program history. The Bobby Dodd Stadium box office is located at 155 North Avenue in Atlanta, Georgia. The current maximum seating capacity is 55,000 and the most recent renovation occurred in 2003. 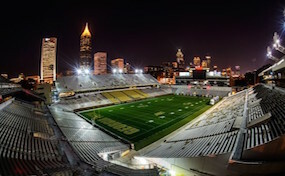 BobbyDodd.StadiumAtlanta.com is not currently affiliated with any box office, venue, website, or official supplier. We are a privately owned and operated company that specializes in offering tickets to all events in the resale secondary ticket marketplace. Prices on our sites can be well below or above face value but will change quickly with demand. To order tickets to all Bobby Dodd Stadium Atlanta events please call our friendly staff at anytime or follow the steps online through checkout.